It's that time of year again, where you are frantically looking all over town and online for special somethings to give to your loved ones, colleagues or your child's teacher. This is where knowing or following a blogger comes in handy, because well they do the homework for you, isn't that just the best, I think so. 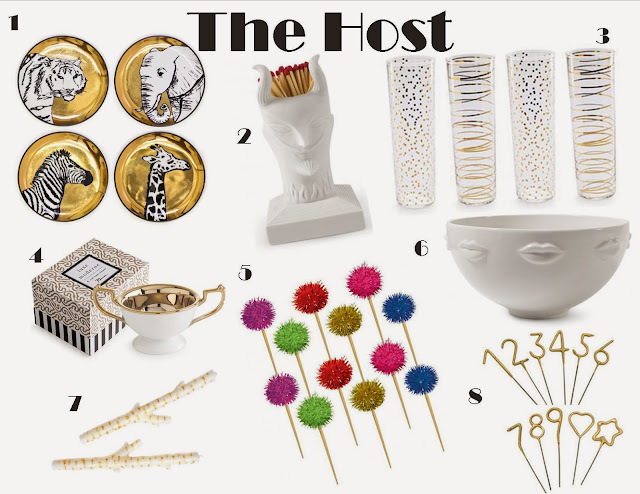 On this first Gift Guide series, I have collected a few items that I find to be extremely chic and so much fun for that person in your life that just can't get enough of hosting parties. You see, I find gift giving so much more fun, when you give or receive a bunch of smaller things that have been collected through the year or at the last minute (I am looking at you procrastinators), because I rather receive a few things than one large thing. This first series happens to come from just one single store, I usually never do that as I like to introduce you to several stores, but this one had so many good things, I couldn't resist. LOVE this and I die for anything by Jonathan Adler.